Just a quick post today. 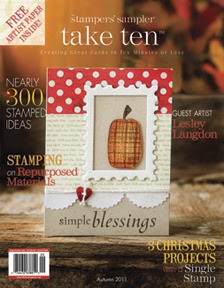 Last week I was on Twitter and saw a sneak peek of the new Stamper's Sampler Take Ten Autumn 2011 Magazine. I was thrilled when I saw one of my circus cards. Stamper's Sampler Magazines don't send e-mails if you get published, they send you a complimentary copy. So last week I got two Take Tens in the mail. I subscribe so I got my normal copy and the complimentary one. I was excited to see my card, but when I looked through the whole magazine, I found a second card that I made featuring the Dragonfly from Stampin' Ups Bugs & Kisses set. Take Ten is a great magazine with lots of cards in all different styles that can be made in ten minutes or less. If you have a copy, check out my cards, they are on p. 120 & 125. It will be on newsstands September 1. Click the picture to link to the sneak peak - my card is the CIRQUE one. Congrats on your publication! Well deserved, ALL your cards are gorgeous! I haven't seen that mag here in Australia, our options are quite limited, I will have to look harder. That is so amazing, two cards in one issue and you didn't even know about it?!!? Congratulations! Your card definitely stands out on that page, it is very very cool! Wow, how AWESOME, Donna! Congrats on the pub!! I'll be on the look out for that issue! So happy for you! How exciting, Donna! Big congrats on your publications! That's AWESOME news, Donna!! WHoo hoo, I am so excited for you! I don't have this issue (yet), but will have to take a look. I submitted some things for their Winter 2011-12 issue, so we'll see what happens! I got your comment saying you saw my cards in Card Ideas by Paper Crafts. THanks!